With three weeks remaining in the NHL’s regular-season schedule, it’s looking like a four-horse race for the final three playoff spots in the Eastern Conference. The Atlantic Division is set, with the Tampa Bay Lightning clinching the President’s Trophy Monday and the Toronto Maple Leafs and Boston Bruins almost certain to renew first-round hostilities. 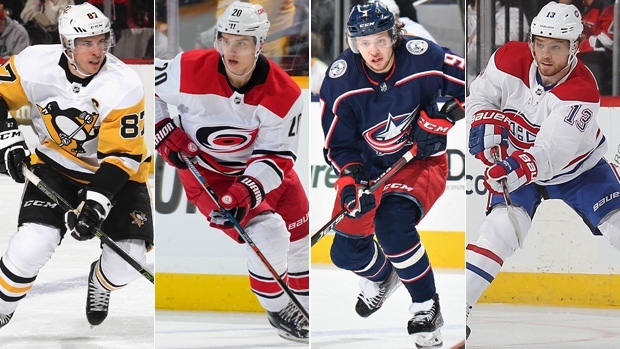 But the final spot in the Metropolitan Division and the two wild-card spots are still up for grabs, with three teams from a group of four – the Pittsburgh Penguins, Carolina Hurricanes, Columbus Blue Jackets and Montreal Canadiens – likely to make their way into the postseason. As of Monday night’s results, the Penguins own the third playoff spot in the Metropolitan, while fellow division foes Carolina and Columbus occupy the two wild-card spots, leaving the Canadiens on the outside looking in. While the Penguins are currently comfortably in the driver’s seat, they’ve played one more game than the Blue Jackets and Canadiens and two more than the Hurricanes. Ranking the teams by points percentage, the Penguins remain first of the four teams (.603), followed closely by the Hurricanes (.599), and then the Blue Jackets (.583) and Canadiens (.563). The Penguins and Hurricanes are also in the best form of the four teams heading into the stretch run. Despite coming off back-to-back losses to the Philadelphia Flyers and St. Louis Blues, the Penguins are 6-2-2 in their last 10 games, only outdone by Carolina and their 7-2-1 mark. The Blue Jackets hold a 5-4-1 record over their last 10 while the Canadiens, losers of their last two games to the Chicago Blackhawks and New York Islanders, hold the worst form of the four teams with a 4-6-0 record over their last 10. More bad news for the Habs: Montreal has the hardest remaining strength of schedule in the entire league. The Canadiens’ final 10 games are split evenly between home and away affairs but their opponents’ points percentage is .605. Montreal’s remaining schedule includes games against seven teams currently in the playoffs. The Hurricanes have the second hardest remaining strength of schedule of the four teams, and third hardest in the league, with an opponents’ points percentage of .591. Six of Carolina’s 11 remaining games are against playoff opponents. The Blue Jackets’ opponents’ point percentage is .545 with just four playoff-bound teams remaining on their schedule, while the Penguins have the easiest remaining schedule of the four with an opponents’ points percentage of .526 but still have five remaining playoff-bound teams to play. The biggest games still to play will be the four- (or five-) point clashes between the four teams. The Canadiens can make up ground, facing both wild-card teams – the Hurricanes and Blue Jackets – down the stretch while the Penguins and Hurricanes still have two games to play, starting with Tuesday’s game in Carolina.